While some users are having trouble with cellular data not working at all in iOS 9 with certain apps, another set of iPhone users are experiencing the opposite problem, with excessive mobile data consumption after updating their iPhones to iOS 9. Given that most users don’t have unlimited data plans, heavy cellular data usage can lead to overage charges pretty quickly, but fortunately there are some easy adjustments that can be made to resolve the hungry mobile data appetite of iOS 9 on iPhones. If you’re experiencing abnormally high cellular data usage after updating to iOS 9, making some changes as outlined below should remedy the problem. 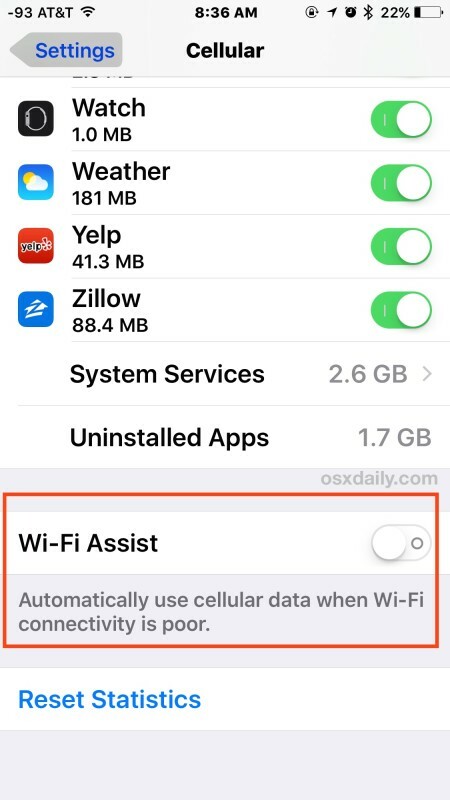 Wi-Fi Assist alone has been attributed to unusually heavy cellular data usage with iOS 9, but it’s by no means the only culprit. 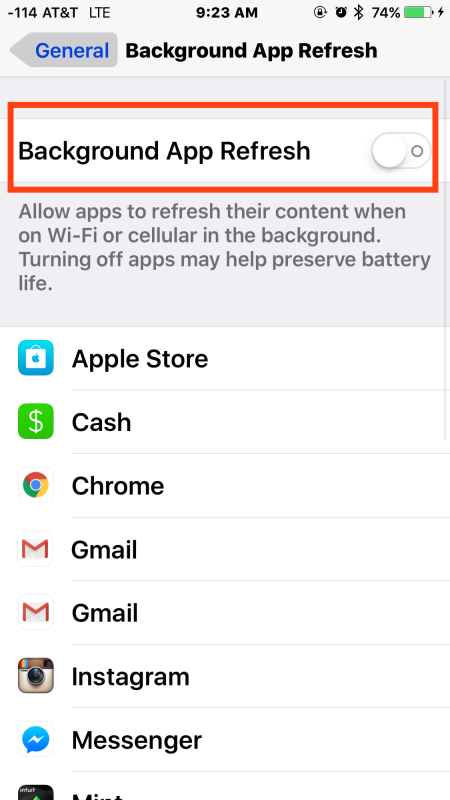 Turning this off just means you’ll need to connect to a wi-fi network to transmit files and data between the iPhone and iCloud Drive. Less data usage, and you may also discover your iPhone running iOS 9 to be performing faster and has better battery life too. Not exactly a bad trade-off! 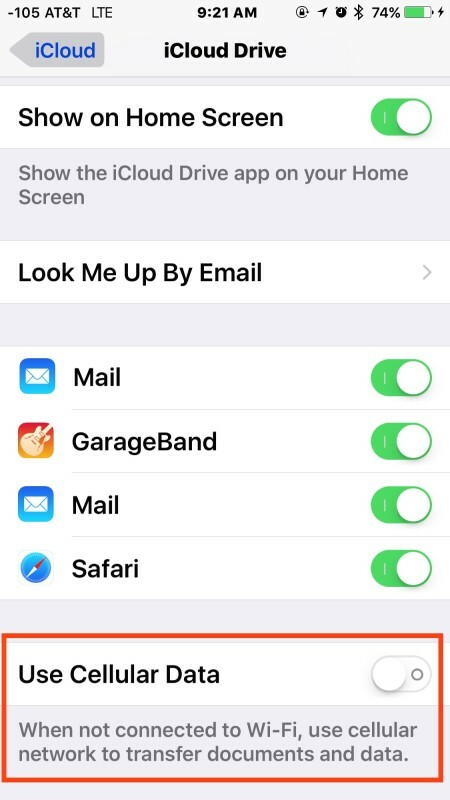 All of these tips should really help to cut down on data usage if you’ve discovered it to be a bit excessive since updating to iOS 9. How high the cellular data use is seems to vary per iPhone user, the networks they use, the apps they have, and what they do with their iPhone in general. For an example of higher cellular data use, here’s my own data plan from Saturday morning through Monday evening, where 1.3GB of data was consumed doing nothing unusual, just normal stuff on the iPhone 6S. But, because of the Wi-Fi Assist feature, a good amount of that 1.3GB of data was offloaded onto the cellular connection when the wi-fi connection was less capable. That’s pretty heavy for usage for just under a four day period, and for users with a normal cellular plan they could quickly eat through their allotment. Of course, if you still have a coveted and ancient unlimited data plan like I do, you may not care about any of this, so let your iPhone eat data like there’s no tomorrow if you want. But for most users with metered data plans, making some changes can avoid overage charges and unexpected cell phone bills. 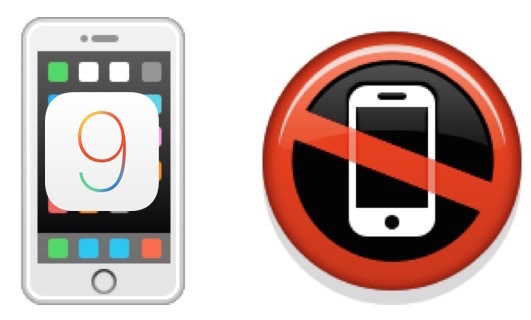 Do you know of any other solutions to remedying the cellular data consumption issue with iOS 9? Do let us know in the comments! Will the Background App Refresh setting turn off notifications on apps as well since they aren’t being refreshed in the background? No, disabling Background App Refresh should have no impact on notifications from apps. It stops the apps refreshing anything when in the background, meaning if you open the Twitter app and then put it into the background, it will have to refresh itself when you go back to that app, rather than it having the latest and greatest tweets already visible. It’s a change that almost no users notices. Background App Refresh is a fairly new feature, unless you have a car battery hooked up to the iPhone it’s rarely worth using for the battery life reduction alone. BTW, I turned off wi-fi assist. Hope that fixes the data issues, iOS 9 is kind of a mess so far! I don’t understand why some folks have strange problems with updates. I have been using iPhone since its inception, haven’t had a single problem. Here is clue. If you are having problems with applications then, it is not the OS. It is your application is incompatible with the new OS. No, no one, tests a trillion plus applications before an OS release. It’s a problem because I didn’t know that my phone was using cellular data even when I was connected to wi-fi if it thought the wi-fi signal was weak or too slow. This feature wasn’t available before iOS9 and the default setting was on. Thus, my phone used up 75% of my data allotment in the first 5 days of the month. Just because you have no problem doesn’t mean the rest of us are idiots. Make a comment when you have something helpful or useful to say. When I open my phone I get hello but cannot open my Apps. I have been told by my carrier here in the Bahamas (BTC) that my iphone’s iOS 9 have been eating up my data ever since the upgrade to iOS 9. I find that hard to believe because the issue started yesterday when my remaining date (235MB) fell to zero remaining in less than 24hrs. From Sep 30th to Oct 14th I had only used (165MB) of date. All my data overage issues started immediately after updating to iOS 9. Went from 0.1 gb to 3 gb in less than 6 hours. 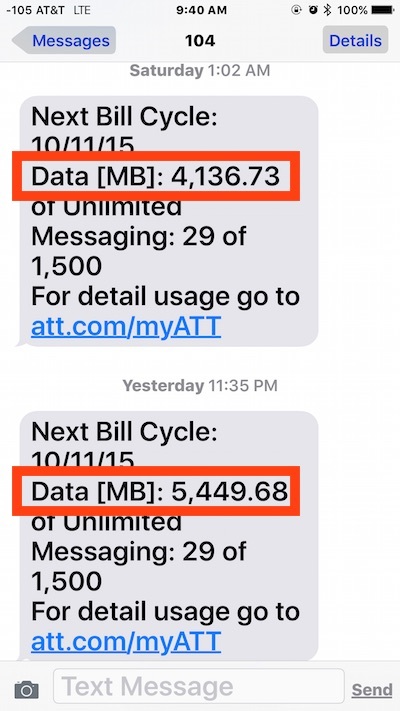 Carrier insists that the data usage is legit. I have shut everything but phone and messaging off of data and still the data usage keeps climbing exponentially. I am taking my backup phone, an iPhone 5 in to Verizon tomorrow and switching to it until this issue is resolved. My daughter has the iPhone 6s 64gb, and in one month’s time, used 20GB of data, I had to keep bumping the plan up bc I had serious overages…. I turned off Wi-Fi assist, all background app refresh, all apps needing cellular, all before she used 20gb… My last option was to shut her data off completely bc I can’t afford the $160.00 a month overage… Does ANYONE else had this issue??? And how did you fix it?? My 4s was great (old ios, not sure which). I used less than 1GB of data a month. My 6s on 9.2, with everything suggested switched off has churned through 2.5GB in less than 3 weeks – its crazy! I have always kept my data on (sure, some people say just turn it off and its not a hassle to switch it off/on, but it is when you are trying to quickly check something in a hurry – its just inconvenient, plus alerts don’t come through – and I have never had an issue over the 3.5 yrs of having my 4s). I know it’s the apps that are using it. I don’t understand why apps that I have always used (such as FB) are using up so much more data than they did on my 4s. They not only use data when open in the background – but are using up huge amounts when actively used. Like x3 as much as on my old phone. Really disappointed and kinda wish I hadn’t blown all that money on this new phone. Any ideas on why they are now using so much more data? Since my iPhone 6 got IOS9, the data consumption has gone through the roof. Without significantly changing my lifestyle, I went from a steady 3 GB for years to constantly butting against the 6 GB limit. I feel like a scam is going on but I can’t put my finger on it. I followed all the tips in the article and got rid of the Facebook app (which I heard was a data sucker). I’d like to see if my data usage goes down, finally. with 4 of us on a plan, 10.5GB, two on an android, two on an iphone, all of a sudden in Feb we started receiving notices of reaching our limit, though normally, ALL 4 don’t even use 5GB. our rollover saved us, but this past month unusually normal data usage again and looking into it saw it was just one iphone. data being used at an incredible rate THROUGH THE NIGHT. now we are told to turn off cellular which is not why you have the phone. this is ridiculous. anyone interested in a class action law suit? most of all while being on wi-fi, like stated above, cell data is being used. THIS IS RIDICULOUS, APPLE! THANK YOU FOR MAKING LIFE MISERABLE…. All of the above comments is another reason why I should have never bought any of Apple’s crappy products. We are all being ripped off. WAKE UP!!! I had try all the suggestions u mentioned earlier n off wat is necessary but still my iPhone 6s with new ios9.3.1 sucking so much data especially fb and wechat… Anymore better suggestion? In just less Thn a week my 10 g data is gone n I Hv to wait till June next month till my next bill! Pls help….. Seriously not happy about this data usage!! !😡😡😡😡Apple needs to make a plan! I purchased the iPhone5se on May 5, 2016, which was just now available. It blindsighted me to find that I went from using .5 GB per workday (business use only) to 3GB to 7GB per day. During the last 3 weeks, I have exhausted every option with AT&T and Apple to remedy the situation. Finally had to visit an Apple store (nearest one is 225 miles from my location) to have them do a factory restore. This may or may not be a solution, so I went ahead an purchased an iPhone4s (like the one I turned in) as a back up if the data usage continues. In my iphone mobile data automatically turn off and it start only after restart. What should i do? Turning on Wifi when useful. Would that not be a more helpful capacity? I need to have wifi-assist turned on. Sure I would save if not using it, but I live in a corner of the universe where coverage is spotty. Exactly where I need the help with calls. I often end up, though, focusing on the wifi. The phone to wifi and wifi to phone crossovers seem to be iffy. Not sure. When I have trouble with the connection on a call, I sometimes find turning off wifi is useful. But, guess what? I forget, and it stays on so most of my usage goes over wifi and I have a high usage. This is the situation I need help with. All my settings have been the same since I got the phone, about three months ago the data started burning up at quadrouple the speed.